saving the internets, one blog at a time – Hi, I'm Caroline. I keep telling myself I should blog about something, because I personally hate it when I subscribe to someone else’s blog and they don’t update except for every other Tuesday when there’s a full moon. Now I’ve turned into one of those people, and I can’t have that. It’s blog blasphemy! Because as we all know, the Internets are actually powered by hot air. If all bloggers were as lazy as me, there would be no more Internets! And then what would I do with my Saturday nights?!? I might actually have to go out and do something, and that’s just… well, I shudder to think about it. But aside from the growing belly and a sudden penchant for beef jerky (OMG DRIED MEAT YUM) things around here are pretty much business as usual. I eat, I sleep, I work, I cook, and I watch my soon-to-be daughter re-enact scenes from Alien via tummy-vision (hey, it beats watching the election debates–besides, she’s infinitely more adorable than Sarah Palin, lemon-shaped head and all). Nope, there’s really not much to say these days. So for lack of all things new, I’ll talk about something old! A few months ago I finished a custom order that I just have to share with you. 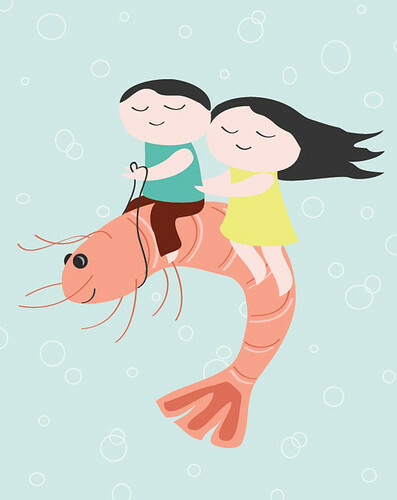 It’s probably the strangest request I’ve had yet–a drawing of a boy and girl riding a giant shrimp–but for that reason it’s my favorite custom order to date. We all know how much I enjoy strange. You can find these two shrimplets on the cover of a new Canadian novel, Bestiaire by Eric Dupont. My client was kind enough to send me three copies of the book and it looks fantastic. Now I just need to learn French so I can read it! Hey, welcome back! Glad to hear things are progressing well. I look forward to tales of the arrival of baby preparations!